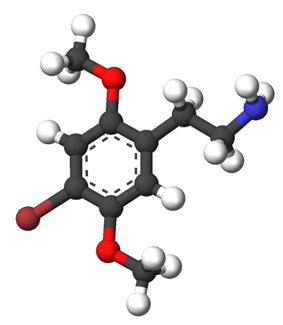 2C-B or 2,5-dimethoxy-4-bromophenethylamine is a psychedelic drug of the 2C family. It was first synthesized by Alexander Shulgin in 1974. In Shulgin's book PiHKAL, the dosage range is listed as 12–24 mg. 2C-B is sold as a white powder sometimes pressed in tablets or gel caps and is referred to on the street by a number of slang names. 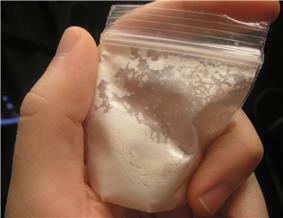 The drug is usually taken orally, but can also be insufflated or vaporized. 2C-B was synthesized from 2,5-dimethoxybenzaldehyde by Alexander Shulgin in 1974. It first saw use among the psychiatric community as an aid during therapy. It was considered one of the best drugs for this purpose because of its short duration, relative absence of side effects, and comparably mild nature. Shortly after becoming popular in the medical community, it became popular recreationally. 2C-B was first sold commercially as an aphrodisiac under the trade name "Eros", which was manufactured by the German pharmaceutical company Drittewelle. For several years, it was available as tablets in Dutch smart shops under the name "Nexus". There are reports of hangover effects, especially when the drug is combined with alcohol. Some users have said to experience a slight irritability for roughly a day or so after use. 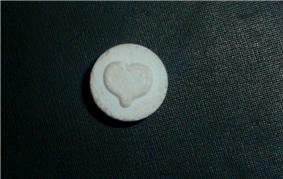 However, these effects are rare and the drug is generally easier on the body than MDMA (Ecstasy). Unlike most hallucinogens, 2C-B has been shown to be a low efficacy serotonin 5-HT2A receptor partial agonist or even full antagonist. This suggests that the 5-HT2C receptor is primarily responsible for mediating the effects experienced by users of 2C-B, although functional antagonism of 5-HT2A or activation of the 5-HT2A-coupled phospholipase D pathway may also play a role. The rank order of receptor antagonist potency for this family of drugs is 2C-I > 2C-B > 2C-D > 2C-H. It is controlled under the List 1, as well as other substances like 2C-I or 2C-T-2. Controlled and on the list of substances subject to import and export controls (Appendix B:). Placed on Schedule One of the Drugs Misuse and Trafficking Act when it first came to notice in 1994, when in a showcase legal battle chemist R.Simpson was charged with manufacturing the substance in Sydney NSW. Alexander Shulgin came to Australia to testify on behalf of the defense (to no avail). Controlled substance, making production, distribution, or possession illegal. CDSA Schedule III as "4-Bromo-2,5-dimethoxybenzeneethanamine and any salt, isomer or salt of isomer thereof". 2C-B is listed as a category B drug. Controlled in the Betäubungsmittelgesetz (BtMG) Anlage I as "Bromdimethoxyphenethylamin" (BDMPEA). Scheduled Summer 1998. Previously marketed as "Performax". Scheduled on July 9, 1997. Schedule II as of March 22, 2004. 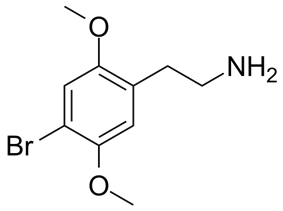 Listed as 4-bromo-2,5-dimethoxyphenethylamine. Added to Category 2 prohibited substances in 2002. Schedule I in Sweden on Jun 1, 2002. 2C-B was first classified as "health hazard" under the act Lagen om förbud mot vissa hälsofarliga varor (translated Act on the Prohibition of Certain Goods Dangerous to Health) as of April 1, 1999 under SFS 1999:58 that made it illegal to sell or possess. Then it became schedule I as of June 1, 2002, publicated in LVFS 2002:4 but mislabeled "2-CB" in the document. However, this was corrected in a new document, LVFS 2009:22 effective December 9, 2009. Listed in Anhang D of the DetMV and is illegal to possess. CSA Schedule I Section (d) Subsection (3) 4-Bromo-2,5-dimethoxyphenethylamine. ^ a b c "2C-B Street Names" (PDF). February 1, 2011. Retrieved 2012-09-28. ^ a b c "Erowid 2C-B Vault: Effects". ^ a b c "2C-B (Nexus) Reappears on the Club Drug Scene" (PDF). National Drug Intelligence Center. Department of Justice. May 2001. Retrieved 11 February 2013. ^ "Drittewelle 2C-B Packaging". Erowid.org. 2002. Retrieved 25 September 2013. ^ "List of psychotropic substances under international control" (PDF). Archived (PDF) from the original on 2 March 2007. Retrieved 2007-03-30. ^ "Schedules of Controlled Substances; Proposed Placement of 4-bromo-2,5-dimethoxyphenethylamine into Schedule I" (PDF). Federal Register 59 (243): 65521. 20 December 1994. Retrieved 2013-09-26. ^ a b Pachico, Elyssa (11/01/2012). "'2CB Now Drug of Choice for Colombia Elite'". InSight Crime. Retrieved 11 February 2013. ^ Gahlinger, Paul (2004). Illegal Drugs: A Complete Guide to Their History, Chemistry, Use and Abuse. Penguin. pp. 343–344. ^ "Erowid 2C-B Vault : Dose/Dosage". ^ Ambrose JB, Bennett HD, Lee HS, Josephson SA (May 2010). "Cerebral vasculopathy after 4-bromo-2,5-dimethoxyphenethylamine ingestion". The Neurologist 16 (3): 199–202. ^ a b "PIHKAL"Shulgin, A (1991) . Erowid.org. Retrieved May 15, 2012. ^ a b De Boer, D.; Gijzels, M. J.; Bosman, I. J.; Maes, R. A. A. (1999). "More Data About the New Psychoactive Drug 2C-B". Journal of Analytical Toxicology 23 (3): 227–228. ^ Cole; et al. (October 2002). "4-Bromo-2,5-dimethoxyphenethylamine (2C-B): a review of the public domain literature". Science and Justice 42 (4): 223–224. ^ a b Caudevilla-Galligo, F.; Riba, J.; Ventura, M.; González, D.; Farré, M.; Barbanoj, M. J.; Bouso, J. C. (2012). "4-Bromo-2,5-dimethoxyphenethylamine (2C-B): Presence in the recreational drug market in Spain, pattern of use and subjective effects". Journal of Psychopharmacology 26 (7): 1026–1035. ^ a b "Erowid 2C-B Vault: Basics". ^ a b "Drugscope: 2C-B". ^ Bronson ME, Jiang W, DeRuiter J, Clark CR (1995). "A behavioral comparison of Nexus, cathinone, BDB, and MDA". Pharmacol. Biochem. Behav. 51 (2–3): 473–5. ^ a b c Carmo, H.; Hengstler, J. G.; De Boer, D. D.; et al. (2005). "Metabolic pathways of 4-bromo-2,5-dimethoxyphenethylamine (2C-B): Analysis of phase I metabolism with hepatocytes of six species including human". Toxicology 206 (1): 75–89. ^ Cole, Krystle. "Neurosoup: 2C-B". Neurosoup.com. Retrieved 2013-10-17. ^ a b Moya, PR; et al. (2007). "Functional selectivity of hallucinogenic phenethylamine and phenylisopropylamine derivatives at human 5-hydroxytryptamine (5-HT)2A and 5-HT2C receptors". The Journal of Pharmacology and Experimental Therapeutics 321 (3): 1054–61. ^ Villalobos CA; et al. (April 2004). "4-Bromo-2,5-dimethoxyphenethylamine (2C-B) and structurally related phenylethylamines are potent 5-HT2A receptor antagonists in Xenopus laevis oocytes". Br. J. Pharmacol. 141 (7): 1167–74. ^ Páleníček, T. Š.; Fujáková, M.; et al. (2012). "Behavioral, neurochemical and pharmaco-EEG profiles of the psychedelic drug 4-bromo-2,5-dimethoxyphenethylamine (2C-B) in rats". Psychopharmacology 225 (1): 75–93. ^ Muehlenkamp F, Lucion A, Vogel WH (April 1995). "Effects of selective serotonergic agonists on aggressive behavior in rats". Pharmacol. Biochem. Behav. 50 (4): 671–4. ^ Glennon RA; et al. (June 1994). "Influence of amine substituents on 5-HT2A versus 5-HT2C binding of phenylalkyl- and indolylalkylamines". Journal of Medicinal Chemistry 37 (13): 1929–35. ^ Heim, Ralf (March 19, 2004). ]Synthesis and pharmacology of potent 5-HT2A receptor agonists which have a partial N-2-methoxybenzyl structure: Development of a new structure-activity concept [Synthese und Pharmakologie potenter 5-HT2A-Rezeptoragonisten mit N-2-Methoxybenzyl-Partialstruktur: Entwicklung eines neuen Struktur-Wirkungskonzepts (Thesis) (in German). ^ "2CB chosen over traditional entheogen's by South African healers.". Tacethno.com. 2008-03-27. Retrieved May 15, 2012. ^ "Last Argentina Controlled Drugs List" (PDF). Retrieved May 15, 2012. ^ "Bekendtgørelse om euforiserende stoffer" (in Danish). 2008-07-01. Retrieved 2013-10-01. ^ "Italy Drug Schedule (Tabella I)". ^ "Förordning (1999:58) om förbud mot vissa hälsofarliga varo" (in Swedish). 1999-02-25. Retrieved 2013-10-01. ^ "Verzeichnis aller betäubungsmittelhaltigen Stoffe" [Directory of all narcotics-containing substances] (PDF). Swissmedic (in German). Swiss Agency for Therapeutic Products. 2011-08-18. p. 2. Retrieved 2013-11-30. ^ "BBC - Advice - 2CB".